So earlier in the week we set a class challenge in SkoolBo. We had two days to complete literacy and numeracy activities and reach 5000 points. We received an email today so can now set our next challenge. Here is the final leaderboard. because it helped me in a lot of thing's. Hi i am Nadia from St Patrick's school.Great job keep up the good work. But maybe next time you could try get higher points on Skoolbo. Hi, I am Pyper from St Patrick's school. 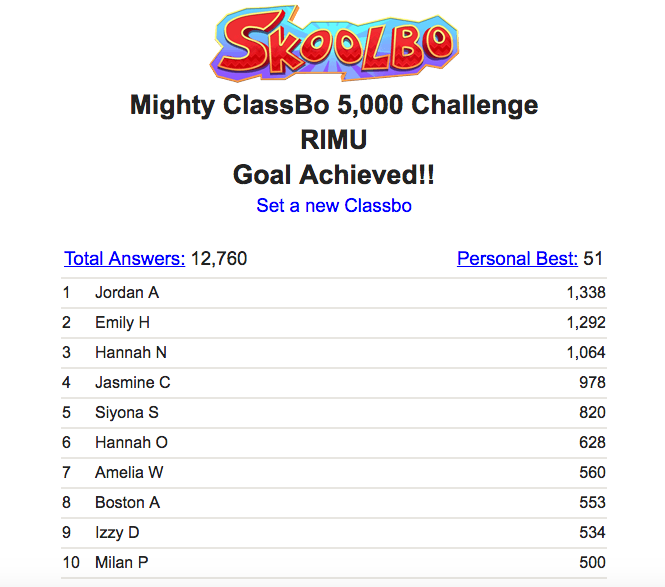 Good job everyone that was in the skoolbo challenge, but maybe next time you could try to earn more points. Hi, my name is Meesha and I'm from Saint Patrick's school. Keep up the good work. Maybe next time you could try work harder to get even higher points.